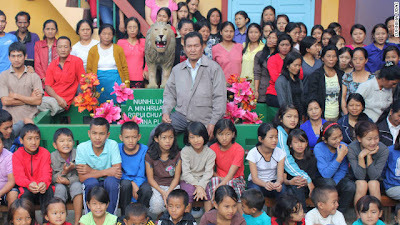 Mizoram, India (CNN) -- The world's population hits 7 billion this week, but Ziona, the patriarch of what may be the biggest family in the world, is not bothered. "I don't care about overpopulation in India ... I believe God has chosen us to be like this (have big families). Those who are born into this family don't want to leave this tradition so we just keep growing and growing," he says with a smile. Ziona, who only goes by his first name, has 39 wives, 86 children and 35 grandchildren. Is 160 enough? Not Ziona, the one man of the world with 39 wives. Even with one wife at home, most men find it difficult to manage. I wonder how Ziona could!! !